Another fun and free bridal shower game! Contact the groom prior to the shower and ask him the game questions (of course, ask him to keep all of this a secret). Now the bride will answer the same questions that we asked the groom. Each guest should write down how many answers that they think the bride will match. The guest that guesses closest to the actual number without going over wins the prize. 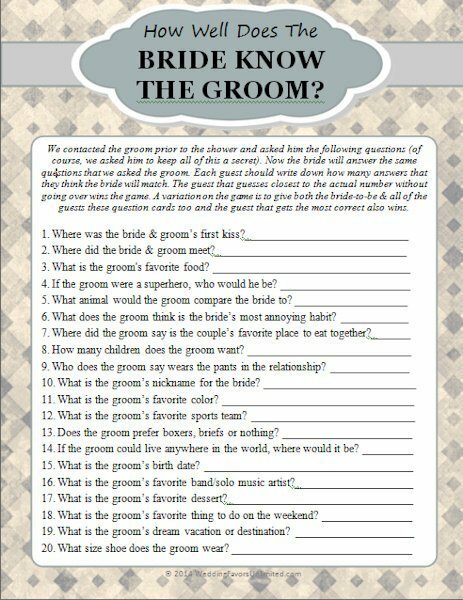 A variation on the game is to give both the bride-to-be and all of the guests these question cards to fill out and the guest that gets the most correct also wins a prize. It will be fun to see just how well the bride knows her groom-to-be! 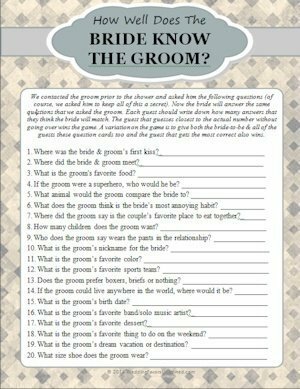 Download the How Well Does The Bride Know The Groom Game today!